Dining tables come in different shapes and sizes depending on your choice. If you have small space for a table then round dining tables will be good for different reasons such as; it is easy to sit around and these do not have any sharp edges so you or your kids wouldn’t bump corners so often. Create a warm and sophisticated dining room which you have always dreamt of, with this formal and elegant Coventry Dining Table. Weathered driftwood with Dover white finish gives this classy piece of art a bold and beautiful look which is sure to invite best compliments from your guests. Made of Hackberry hardwood solid, birch hardwood solid & the ash veneer. Weathered driftwood with Dover white finish. Table top is securely bolted with the base. Leaf extends table surface from 48″ to 66″. Single pedestal with base levelers. Can accommodate 4 seats when the leaf is used and with 6 seats when leaf is not used. Stylish and elegant Wildon Home ® Dining Table is ideal to give a warm and sophisticated semi-formal look to your dining room. Traditionally fashioned pedestal base is topped with dark walnut finish smooth round table top intensifies the bold and classic look. 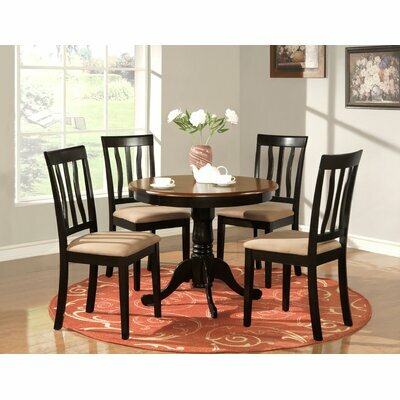 Complete the dining set with matching upholstered arm-chairs for exquisite dining experience. 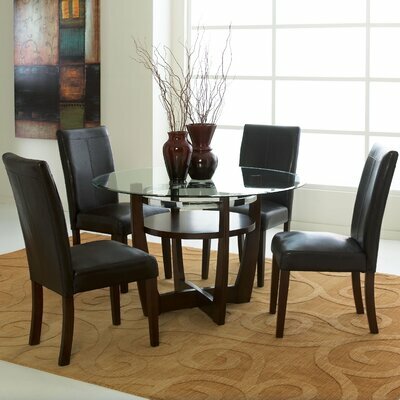 Classy Wildon Home ® Dining Table. Made of solid wood with wood veneers. Table top surface is polished with a protective coat. 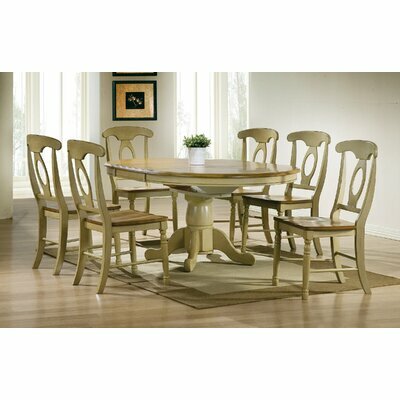 Country style inspired Paula Deen’s Dining Table will add warmth and comfort to your dining experience. Unique antique look with distressed finish enhances the elegance of this classic piece of art. Made of hardwood solids and pin-knotty cherry veneers. Includes a leaf for extension. Distressed finish enhances elegant country design. Multi-stage sanding and finishing to give this table a unique antique-look. Available in Tobacco and Linen finish. Turned vase shaped pedestal ends at hexagon shaped base. For better results, use a microfiber cloth to clean the table surface. Add a touch of sophistication to your dining room or kitchen with gracefully fashioned WOIM Antique Dining Table. This classic and stunning table features a beveled edged round table top with gorgeous pedestal stand and four elegantly carved legs. WOIM Antique Dining Table collection. Table top has beveled edges. Single pedestal with four elegantly carved legs. Available in Oak, Cappuccino; and Black and Cherry finish. With this beautifully turned pedestal base and the sweeping arm of accenting chairs, the term “traditional” takes on a whole new meaning. This elegantly fashioned Dandelion Dining Table compliments the décor of your house giving you and your guests a pleasurable dining experience. Constructed from poplar wood and wood veneer. Traditional style with distressed taupe finish. Single turned pedestal with base. 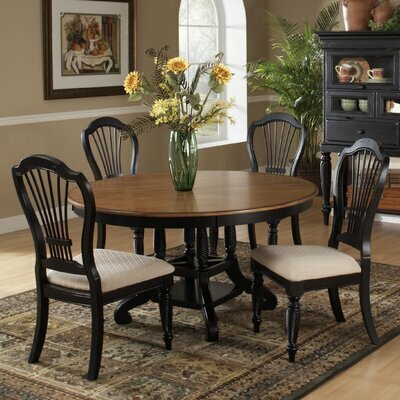 The stunning and classic look of this country and cottage style inspired Rustic Oak Round Single Pedestal Table gives a warm and radiating feel to your dining area. 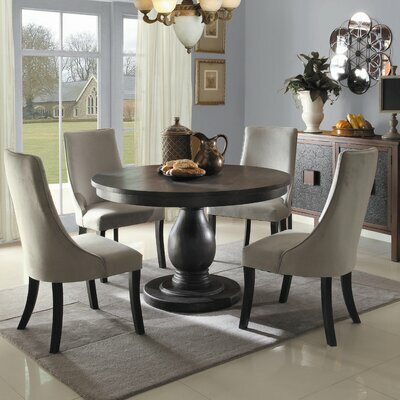 This easy to assemble gorgeous dining table features a smooth two-toned circular table top, a stylish and classy turned pedestal base with feet levelers and a self-storing butterfly leaf. 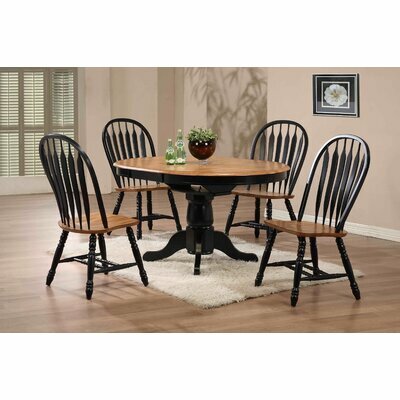 Rustic Oak Round Single Pedestal Table collection. Single turned column pedestal base and feet have levelers. One self storing butterfly leaf. Can easily accommodate 4 chairs. Product Care: Use protective pads or mats on table top for placing hot pots, plates or dishes. Avoid spilling any kind of liquid as it may cause damage to the polish and wood. Use a microfiber cloth to clean the dust and the wiping direction should be in the direction of wood grain. 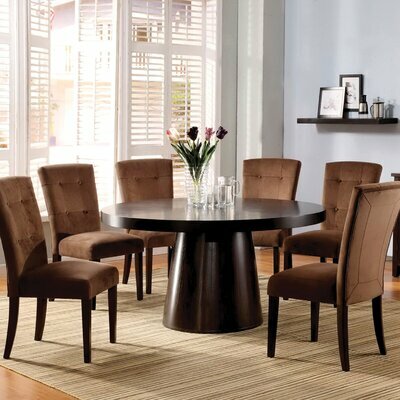 Grace your dining interior with stunningly elegant and chic appeal of the trendy Zoie Round Dining Table, accentuated with a rich espresso finish, generous 60″ round top and stylish drum base. Round table top with stylish drum base. Can fit 4-6 chairs easily. Dining table set is ISTA 3A certified. Warm and inviting look of this decently fashioned Pelican Point Dining Table is sure to get you many compliments from your guests. 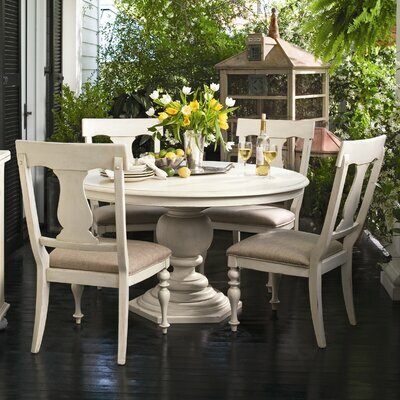 This appealing dining table features claw style pedestal base with self-storing butterfly leaf. It has Solid hardwood construction. Manufacturer provide 1 year warranty against any defect. 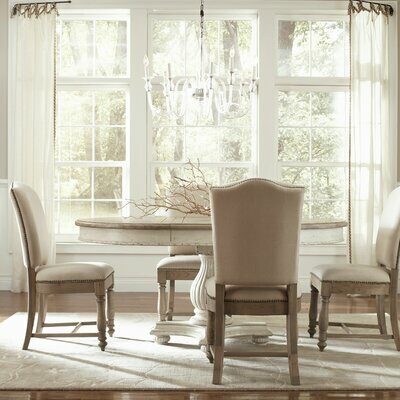 Stylishly elegant Wilshire Dining Table features attractive blend of cottage styling with the combination of Americana and English Country accented details to give your dining interior a warm and inviting feel of visual enhancement. New Zealand pine wood construction. Cottage style accentuated with country detail. Available in Black, Antique White and Antique Pine finish. This stunning Apollo Dining Table exudes a rhythm of contemporary art and elevates your dining room space to most exquisite dining experience with family. Solid wood construction with veneer. Crisscrossed legs base topped with display center shelf to add stability and style. General Conformity Certified dining table.